Prabhu Sozhan, who had apprenticed under ace director Shankar, is set to don the director’s cap. 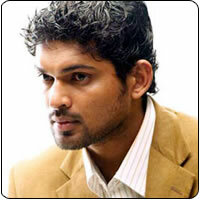 The hero he has chosen for the project is Ajmal of Anjathe fame. Interestingly, Ajmal gets an opportunity to don the greasepaint for a dual role, so early in his career. The movie, which has been titled Karuppampatti, is a village-based subject that is set in the 1970s, we hear. WHO WANTED SHAH RUKH’S FILMS TO FLOP? Who is the 4th idiot?